And that means faster sea level rise, faster global warming, and more extreme weather for us. 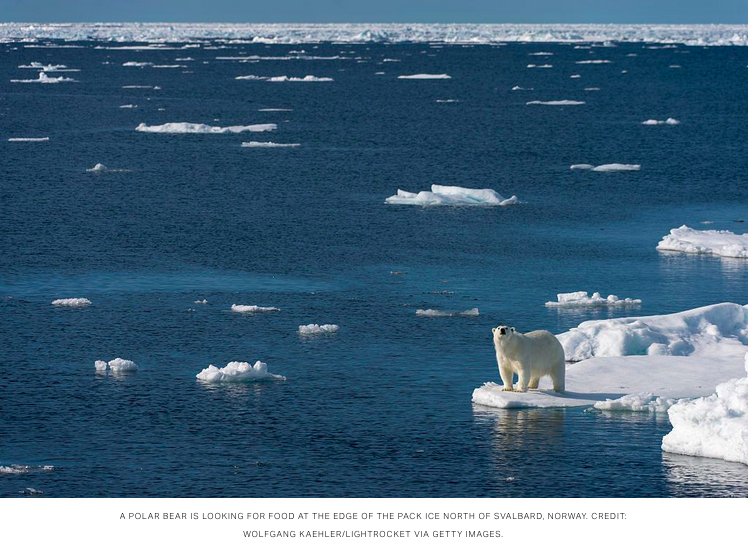 The annual Arctic Report Card from the National Oceanic and Atmospheric Administration (NOAA) is out, but it appears that humanity is flunking science badly. Note 1. As NOAA reports, “Arctic air temperatures for the past five years (2014-18) have exceeded all previous records since 1900.” And one stunning result of this is that 95 percent of the oldest and thickest Arctic sea ice has disintegrated in just three decades. The Report Card makes clear that our failure to slow global warming has led to an all-but irreversible Arctic death spiral — which in turn is driving more extreme weather in this country, faster sea level rise everywhere, and more rapid disintegration (Note 2) of the carbon-rich permafrost (Note 3), which in turn causes even faster global warming. 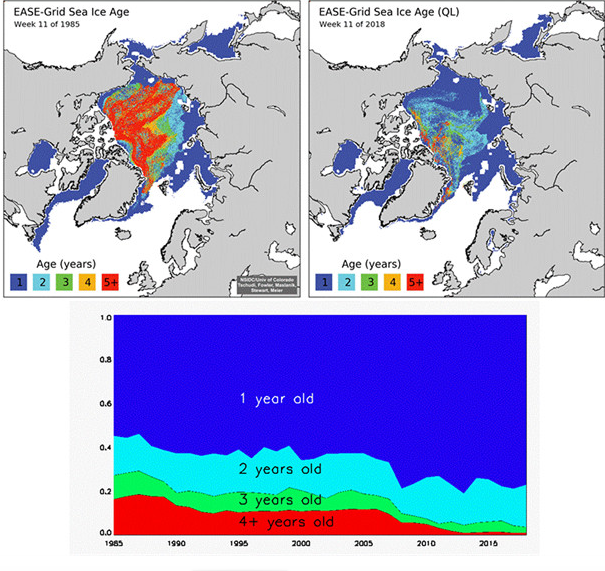 Climate models have always predicted that human-caused warming would be at least twice as fast in the Arctic compared to across the planet as a whole thanks to arctic amplification — this is when highly reflective snow and ice melts due to higher temperatures, it is replaced by the dark blue sea or darker land, both of which absorb more solar energy, leading to more melting. See Note 2. Even so, NASA scientists who in March flew over the region north of Greenland — home to much of the Arctic’s oldest and thickest ice — were stunned by how much the thickest sea ice had been broken up into pieces as opposed to remaining a solid sheet. NASA cryo-scientist Nathan Kurtz, who has been on many such research flights, told the WashingtonPost, “I was just shocked by how different it was.” Note 4. Unfortunately for America and the rest of the planet, the best science makes clear that what happens in the Arctic doesn’t stay in the Arctic. Note 5. “Growing atmospheric warmth in the Arctic results in a sluggish and unusually wavy jet-stream that coincided with abnormal weather events in both the Arctic and mid-latitudes,” as NOAA’s Report Card explains. In short, the Arctic’s rapid warming is driving more extreme weather in this country, such as heavy precipitation on the East Coast and extreme drought on the West Coast. Rapid arctic warming also speeds up the release of heat-trapping carbon dioxide and methane from the thawing permafrost — a dangerous amplifying feedback that in turn speeds up warming planet-wide. Finally, the faster the Arctic warms, the faster the land-based Greenland ice sheet melts and the faster sea levels rise. Note 6. One 2017 study found that Greenland ice mass loss has tripled in just two decades. Note 7. Unlike students who fail a test in school, there are no do-overs or make-up exams for humanity’s failure in the Arctic (and everywhere else on the planet). Failure just means ever worsening climate impact for our children and grandchildren and countless generations to come. Joseph Romm, Ph.D.,is one of the United States’ most influential communicators on climate science and solutions. Romm is Chief Science Advisor for “Years of Living Dangerously,” which won the 2014 Emmy Award for Outstanding Nonfiction Series. He is the founding editor of Climate Progress, which New York Times columnist Tom Friedman called “the indispensable blog.” In 2009, Timenamed him one of its “Heroes of the Environment,” calling him “The Web’s most influential climate-change blogger.” In 2009, Rolling Stoneput Romm on its list of 100 “people who are reinventing America.” Romm was acting assistant secretary of energy in 1997, where he oversaw $1 billion in low-carbon technology development and deployment. He is a Senior Fellow at American Progress and holds a Ph.D. in physics from MIT. Dr. Romm is also author of Climate Change: What Everyone Needs to Know (Oxford University Press, 2015).